Yes, it's hard. 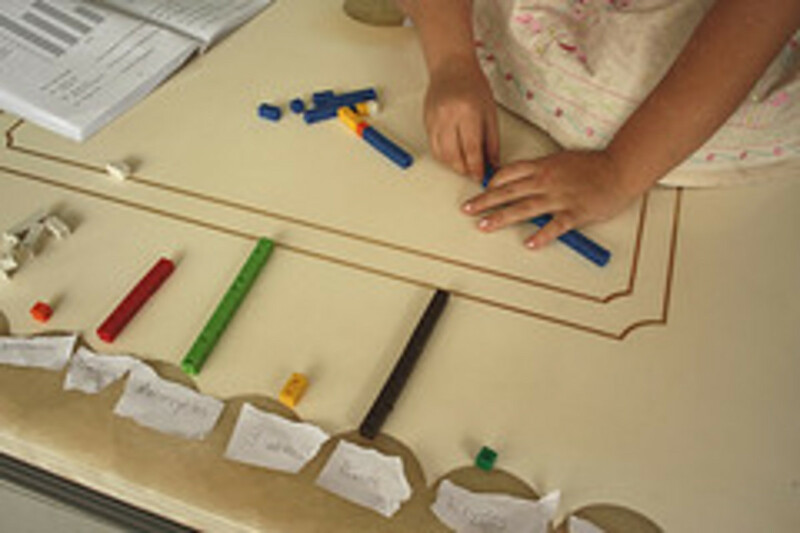 Very, very hard to set aside the workbook and orderly math progression through an outlined curriculum and shift to what seems to be a messy, random bunch of games and hands-on activities. You love the concept of living math. You know that it's fun. You even know that your children would learn through it. But, there are still those nagging concerns -- What about gaps in their math learning? What about drill? What about memorization? What about standardized tests? When will I find time to prepare all these games and clean up after all these messy activities? Here's my own journey from textbook prison to living math paradise. Okay, it's not quite so glamorous as that! But this is how I shifted my thinking and am (still) transitioning to a living math approach. I'm not a math expert or even a math person. I think in words not numbers. I have trouble remembering which number bus takes me downtown, but I can easily remember the names of all the stops on the way. This is just one homeschoool mother's attempt to try to make some sense of math instruction and make it enjoyable along the way. Come peek into my journey. Where are you in the living math transition? I'm still trying to figure out what living math is. I've incorporated a game day here and there. We've moved to a math history outline for our math studies. We use lots of living books and hands-on, real-life activities to learn math. We only use our textbook and workbook as a supplement now. The textbook has been tossed, and we'll never buy another one! For the Living Math lesson 1, I couldn't find even one of the recommended books. So I got this one instead. It was a super introduction to living math. It got us thinking and made us go off on tangents. Although the storyline is a bit contrived, this book is a very fun introduction to the idea that math is all around. We enjoyed these tangents inspired by this book--tessellations, Fibonacci numbers, prime numbers. The book also has one page biographies of famous mathematicians. It all started with this book, recommended to my by a homeschooling mom who spoke at a homeschool conference I attended. I found a used copy and read over it. Like many resource books, it found a comfy spot on my bookshelf and was promptly forgotten. Over our years of homeschooling, I've slowly incorporated more and more of Charlotte Mason styled learning. I'd already added in artist study, composer study, nature study, even poetry and Shakespeare. We were using living books for history and science. Math was the last holdout. I had read about a "living math" approach -- using living books and real life tasks instead of using textbooks and worksheets. I already understood what Charlotte Mason herself had written about math instruction. I liked the ideas in theory. But to actually use them? It seemed ridiculous. If I don't follow the book, I'll leave out important math ideas. I'm not strong enough in math myself to guide our learning without a curriculum. I love living books, but how can they teach math? I mean, math is numbers. If Sprite does a lot of math games but never does any drill or any worksheets, how will she be able to perform on standardized tests in the future? But as I read more and more and tears during math lessons became more and more frequent, I knew something had to change in our math instruction. I was reading blogs like Our Journey Westward, Lapaz Home Learning, and Let's Play Math. I liked what I saw in their approaches to math. I even read the long 25 page Lockhart's Lament. Finally, I committed to having one day a week with math games. That was my first step. Nothing changed except for that one weekly game day. I would try to pick a game that went along with the topic we were studying in our Singapore math book. Family Math's games are set up by topic, so it's easy to find a game that fits what you're studying. Those days were grand successes in terms of attitude, learning, and motivation. It kept me searching for more answers about living math. Here are some photos of those early games and activities. We played some fraction games and made a huge number line from 1-20 with all the multiples of each number made from a gazillion tiny paper squares. We rolled dice and dealt cards. We both started to look forward to our weekly math game day. I then began to get serious about planning more extensive changes. I could see that doing a game elicited excitement that a worksheet never could. 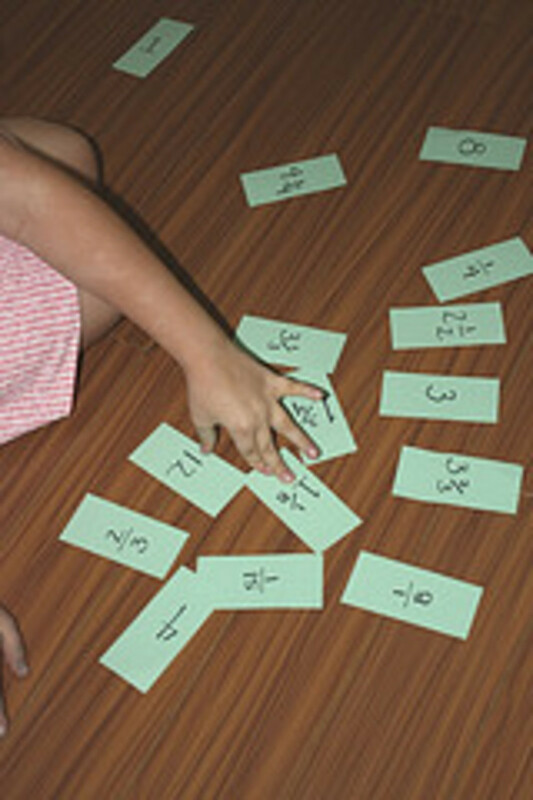 If the arithmetic skills were the same, then why not do them in a fun way versus a dull one? We started playing math games and activities every day, using the Singapore Math textbook as a supplement, pulling it out every now and then but not daily. 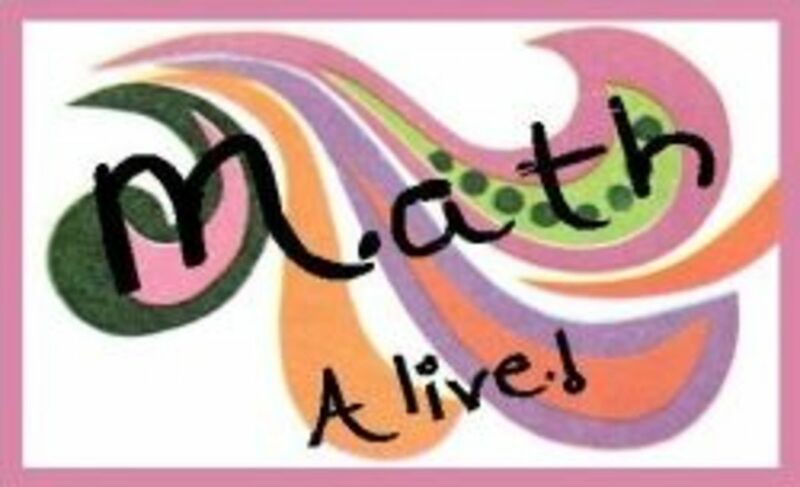 I pored over and over the Living Math lesson plan information, hoping it would be the answer to my quest for a rich math curriculum, filled with games and living learning. Her Cycle One Outline and booklists are available free, online. So although I've purchased the lesson plans ($20) for Cycle One, Unit 1 Intermediate Level, I'm not giving away any secrets here. Instead I'm sharing how we made it our own and implemented the ideas of living math. Lesson 1: Math is Everywhere! And the lessons continue as such through history in the subsequent units. Julie's Living Math lessons are more math theory and math history than arithmetic. You travel through history chronologically, seeing how math was used and what math discoveries were made. Once I bought the lesson plans, I realized that this wasn't what I was looking for. It was a good addition to what I wanted. But it was not the whole picture. There are one or two activity ideas for each lesson, but it's not thorough enough to be a complete math curriculum. 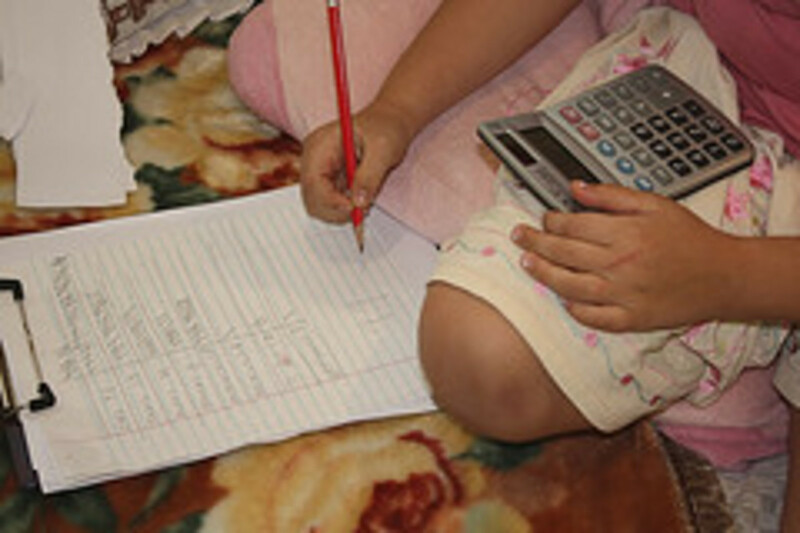 You still have to have your own games, math activities, and arithmetic lessons. The Living Math booklists are incredibly lengthy and a bit confusing since so many of the books are out of print. It took me weeks to pore over them and figure out which books were used in which lessons and which ones were vital and which ones were supplementary. There was quite a bit of guessing as well because aside from the input of two moms on the Living Math Yahoo group, I had only the information at Amazon to make my decisions. I finally decided on a group of books and placed my order! I chose books from the Living Math curriculum list plus some general math books to pique Sprite's interest. I ordered and implemented the Living Math lesson plans, using many living books from the Living Math booklist. I personally like the Brown Paper School books better than the Penrose books. Although they come highly recommended, the Penrose books still feel a bit "school-ish" to me. Quite the opposite, the Brown Paper School books are written to kids with that sort of "try to trick the grown-ups with this math problem" kind of witty humor. Penrose is simply not as engaging. The Brown Paper School books are also recommended on the MA Dept. of Education math literature lists. Through this investigation process, I've come to grips with my former fears about the living math approach. I'm not strong enough in math myself to guide our learning without a curriculum.That's all the more reason to make math fun and engaging -- both for me and for my daughter. My natural tendency is to avoid math. But by being more proactive in designing our curriculum, I'm becoming more interested in math. That excitement rubs off on my daughter! And again, I can still use my Singapore math texts as a guide for the skills to cover. The HOW to cover them is up to me. I love living books, but how can they teach math? I mean, math is numbers.WRONG. Numbers are one aspect of math. But logical thinking, problem solving, and mathematical reasoning are all parts of math education. If Sprite does a lot of math games but never does any drill or any worksheets, how will she be able to perform on standardized tests in the future?Taking a living math approach doesn't mean that she never does any drill and never fills in a workbook page. Those things simply become supplements to the real-life activities instead of being the core. So in revamping our math, I decided on some goals and outlined some facets that would need to be covered to reach those goals. I would've been nice to start my journey with these goals, but to be honest, I had to plunge into this living math journey and flounder around a bit to discover what my goals are. How to implement them? Well, it seems to be a three-faceted approach. I am working the plan! We aren't really spending much more time on math than we used to before the big shift, but the time is so much more productive. I'm using the outlines from Living Math for the history (facet #1) plus some overlap into the activities (facet #2). 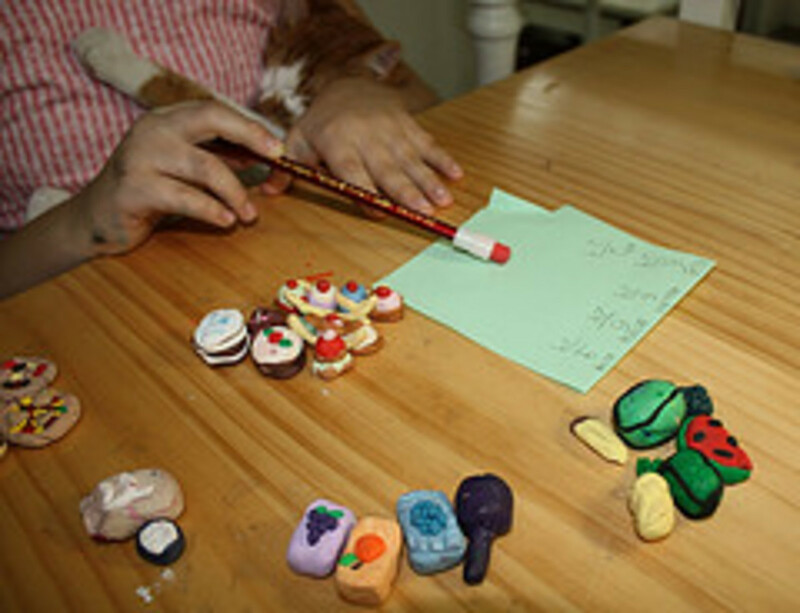 (Julie's curriculum does include some activities.) You can read my full review of Living Math curriculum at The Curriculum Choice. And I'll keep using Singapore math for the arithmetic (facet #3). But for the experiences and games, I'll have to be the most creative -- searching for goodies online, using my Family Math book, and trying to incorporate math into our daily lives as much as possible. It's not cut and dry. The three areas overlap into each other quite a bit. And that's a wonderful, holistic perspective of math! There is no open and go curriculum that covers all that I want our study of math to cover. So I'm picking and choosing, making it up as I go. This is how I tackle the arithmetic and games aspect. I pull out my Singapore math textbook and look at the overall units -- measurement, time, or fractions, for example. Then instead of starting with the textbook explanations and workbook exercises, I search for games, puzzles, activities, or living books to introduce and practice the concepts and skills in a fun and living way. I'm also trying to incorporate more math notebooking into our studies. So I'm using graphic organizers and notebooking pages plus writing prompts about math. After experiencing the math concepts in various ways, then we move to the workbook as a review or wrap up. By that time, Sprite has confidence and proficiency in the skill and performs very fluently. A great list of things to incorporate into your math instruction to make it living. Another glimpse into the transition. The following three books plus Number Stories of Long Ago by David Eugene Smith are serving as the spines of the math history element of our living math. These books are used extensively in the Living Math lesson plans. You can see the other books I bought here at this Amazon list. For lesson plans to go along with many of the chapters in Mathematicians Are People, Too visit Ohio Resource Center. This book is wonderful! The stories are really interesting and have great black and white line drawings for illustrations. We copied the drawing of Thales and used in on a math notebooking page. I really like it when subjects intersect, so I love the idea math poetry. Thank you for sharing your journey into living math! My daughter struggles with math. We have been using textbooks and she gets more behind every year. I think it's a combination of things like fear, confusion and boredom. When I do some more online research I am going to select a living math book for 8th grade. Have you ever looked at the Life of Fred books for math? Thank you for taking the time to chronicle your experiences! This is precisely what I needed! The sad thing is that I taught public school and led family math nights to encourage living math in the home. But now as a busy homeschooling mama, the workbook gets pulled out more and more. Sigh... I'm excited this year though. The times, they are a-changing! Wow great advice and great lens! Impressive and informational! Thanks so much! just found this article, and simply loved it. Thank you for sharing. I am just about to embark on homeschooling and looking for ideas for Living Math! Wow, thank you so much for sharing this. Really insightful. I have had lots of frustrations this past year trying to find our way through this (mostly just urging my kids to get their drills done...agh! NOT how I want our math experience to be!).... Wonderful ideas. 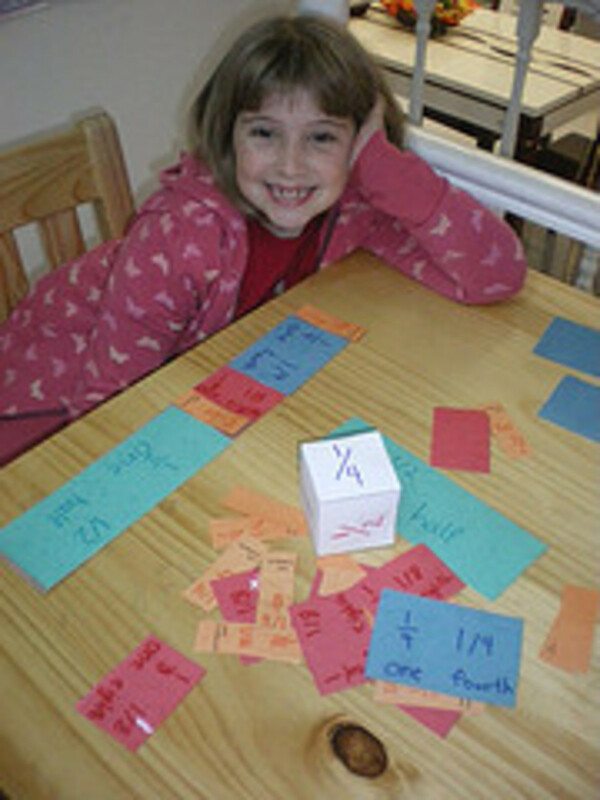 Right Start Math has a games pack that has many math games organized by topic. It can be used with their curriculum or it can stand on its own. In other words, the game book explains how to play all the games and doesn't rely on the curriculum manual. 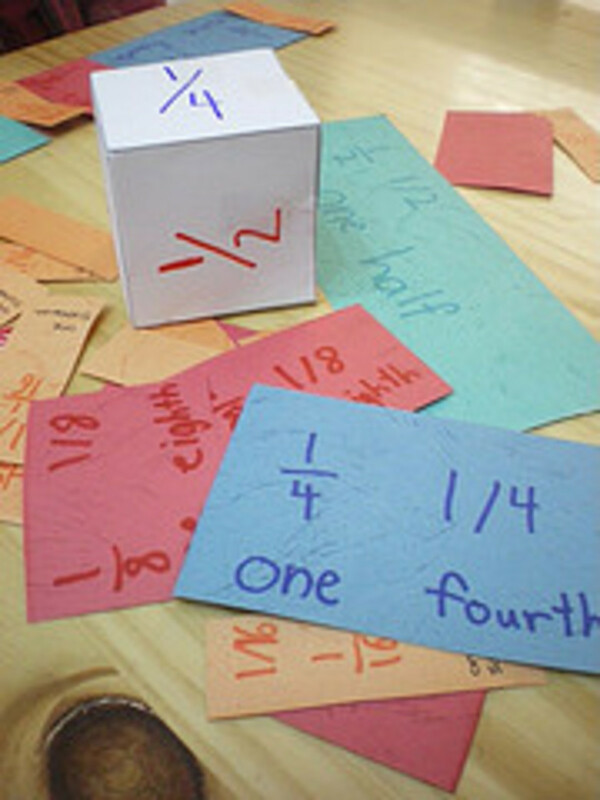 I have found it a very fun way to learn and practice many different math concepts. This is terrific! I am just where you are. I have no problem using real life to teach everything, but I have held onto my math books because I worried about missing things, too. I am going to "favorite" this blog so that I can dissect it more thoroughly as I go. Peace! Wow, great info! Angel blessed. I might have been able to do math, if it hadn't been so dead when I studied it. Sounds good! Jimmie, you are AMAZING. Thanks for all the help. My girls are 5 and 3, and I'm going to brave it out and take this living math approach. I'll have some print outs from the free program called MEP to use at the end of lessons, but I think I CAN DO IT after reading your lens. @homeschoolmomof2: Saxon is certainly not a living approach to math. BUT you can use the textbook as a supplement to your living method. I use my Singapore textbooks to keep me on track with choosing skills and concepts. And I still have my daughter do a select workbook page or two now and then. There's nothing wrong with that. So, yes, Saxon math could be part of a living math curriculum. I wish you the best in your study of math! I have beenwondering a LOT about living math. I am not afraid of holes in education and have been doing living history for a number of years and I live it! But, I am very intinidated by living math. :( I have a 9 and 11 year old. My daughter was burned out on math at private school as they kept going even when she got a lot wrong and didn't understand what she was doing. They had to keep to the yearly schedual. But with the freedom of homeschooling I want the best thing for the children and we don't have to keep with the yearly schedual. I have Saxon all the way up to Algebra. Can I use the Saxon and do living math as well? Would it work ? Or would you ditch the Saxon? This is really helpful. Thanks so much! We've used a living math approach all along but as my kids get older I keep worrying that I need to switch to a textbook approach. This helps me see how to blend them together. Another awesome lens, Jimmie. It's been added to my links list! Wow, Thank you very much!! This is sooo helpful!! You must think I'm always copying you---lol. I have been reading about Living Math and have been trying to figure out how to incorporate this w/ 4 different math levels. Math totally is not working at our house and I want to make it more fun. The lists you've included and links to reviews are very helpful because I was getting confused w/ the Living Math website and shelved the whole idea. Thanks for getting me interested in rethinking this again. I'll be posting this on my blog some time this week. I am a mom with kids in a traditional school. They are not really learning math. I am considering pulling them out and homeschooling. Is it too late to start living math with my 5th grader?? @anonymous: Rio543, I say it's never too late to start doing something positive. If you do homeschool your children, I strongly suggest the living math approach. It works. Excellent job Jimmie, 5*****. I truly believe that if you remove the purely textbook side of mathematics and introduce children to the practical and everyday side of it, then they will enjoy it, and be doing sums with lots of things that they see around them. Getting children to appreciate and enjoy any topic is key to their learning skills in my opinion. Love this. 5*s and lensrolled. Thanks. Please consider adding it to the Lesson Plans Group under the appropriate Plexo. You've inspired me again Jimmie! I have just spent ages going through your links and looking at books and thinking through my math objectives. I like the way you have thought through your goals/facets. I think one of the biggest benefits for living math is that our children start to understand the language of math and the thinking skills. Thanks for sharing your story - it certainly makes me a little closer to following my heart too! I have used the cirruculmn that our charter school issues for the last 3 years, but this last year I have seen my boys just dread math. I recently went to a seminar that mentioned Living Math and so that started me on a new path. I like the looks of Living Math but was a little concerned about the arithmetic part of math. 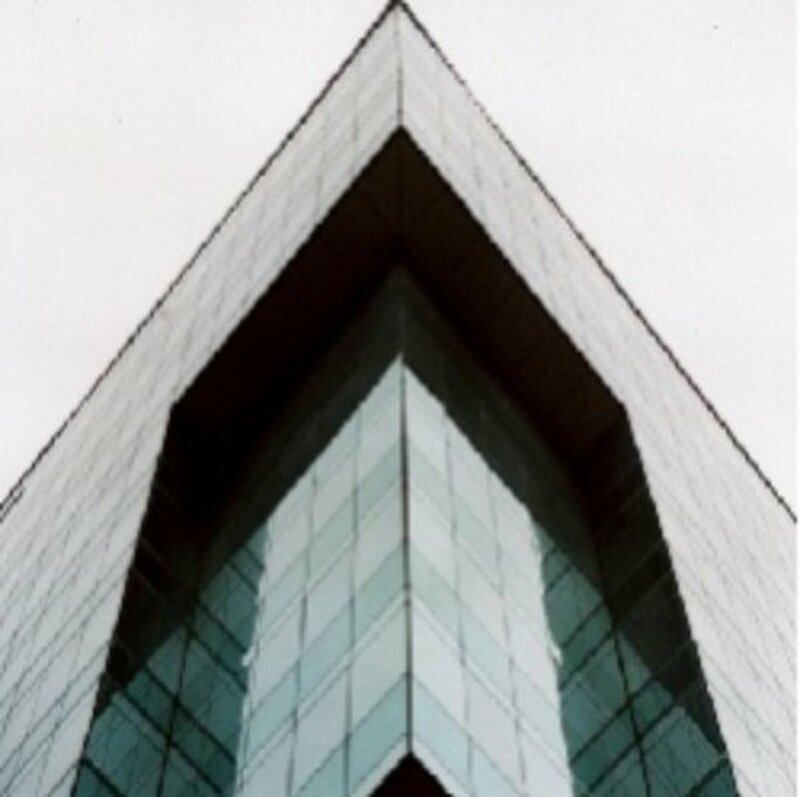 In looking for someone elses view on Living Math I found your site. I really appreciate all you input and think that this is the path we will take. Thank you! I promise I didn't come looking for just your lenses! I ended up here from a living math search, and voila! Here I am at a site of yours again! Great minds think alike... We're working towards a more living approach... though we've been doing pretty well with math-u-see as pretty alive as far as texts go, especially with the videos and great tricks that Steve Demme uses. But I have one boy in need of more... so I'm out investigating once again! I'm mainly looking for the living math books. 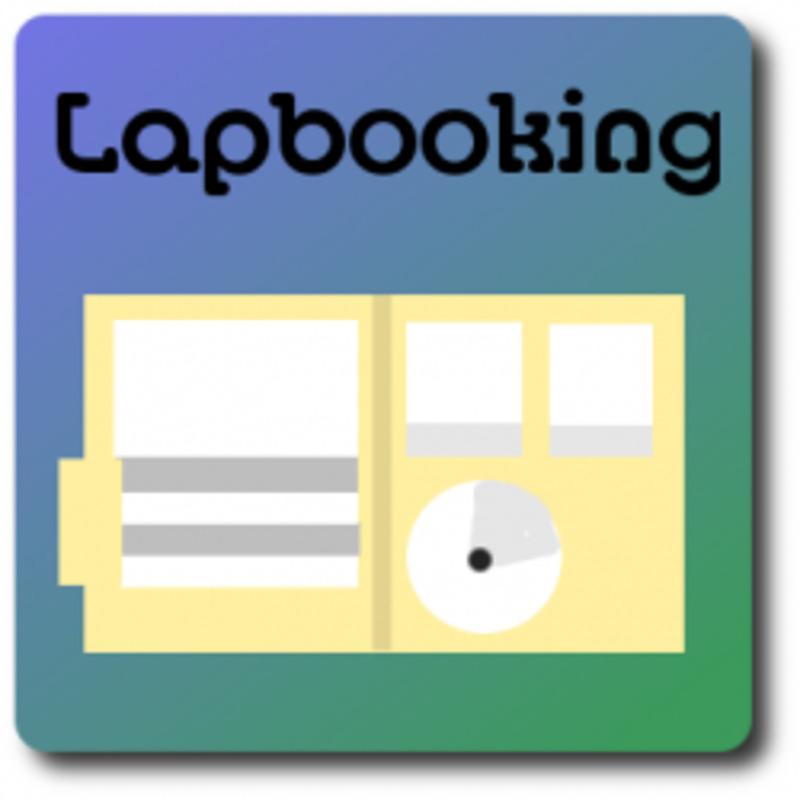 I've downloaded the LivingMath booklists, and so will use those some, but because like yourselves libraries aren't an option for us, I'm really going to have to be choosy. I'm checking out your recommendations too. Tell me if you have any others you'd also recommend for us... 11yo boy in particular. Beautiful site--your blogs are quite a blessing! Welcome to The Homeschooling Group - you're a featured lens! Thank you so much for this. I am endeavoring to move out in this direction this summer and next school year. This is a great resource to get me going. My ten year old doesn't care for math but my seven year old loves it so I really appreciated your objectives as well. Pray for me though as creative ideas are not usually a problem, it's the time it takes to implement them that I am usually lacking! This is real nice. As a Mathematician I think, this will help a lot more to learn "how to think in a mathemtical way" then the usual ways of teaching. I think this is a very interesting concept. Some teacher friends have said this is a direction their schools are going in as well. 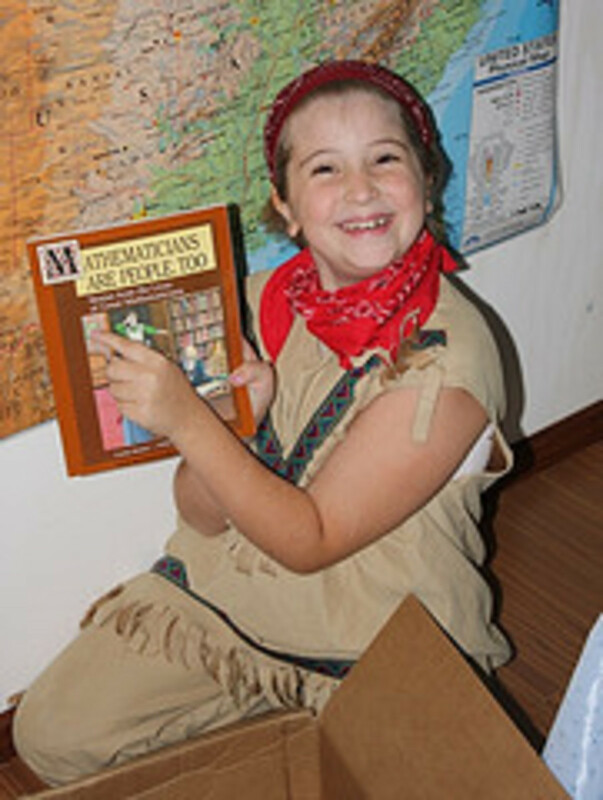 Mathematicians are People too is a book that both of my children have loved. Another they enjoyed is Penrose the Cat. Another brilliant lens and a great resource. Funny thing is that I have Family Math sitting nicely on my shelf and had decided to do math differently over this summer. We've been using Miquon Math and it has worked well, but I have to admit I love math. I'm looking at not having her finish the purple book (last of 6) this summer and just do some living math. I picked up Zoo Tycoon yesterday and saw a Living Math series at the library. But you've inspired me to just go to my shelf and check out my Family Math book. And I'm so excited to see they have a book for older kids. One thing on my wish list is the Waldorf math book (1st thru 8th) because they use alot of stories to get the concepts across. 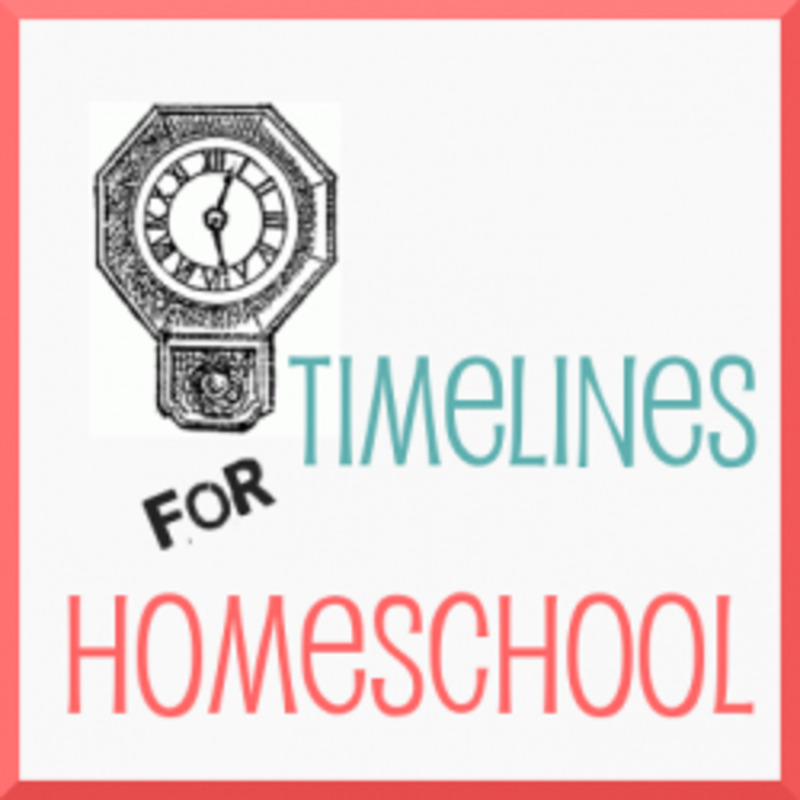 I'm looking to put a little more fun in my homeschool and am so glad I was recommended your blog today! When we homeschooled we rarely used textbooks. They were not very productive. 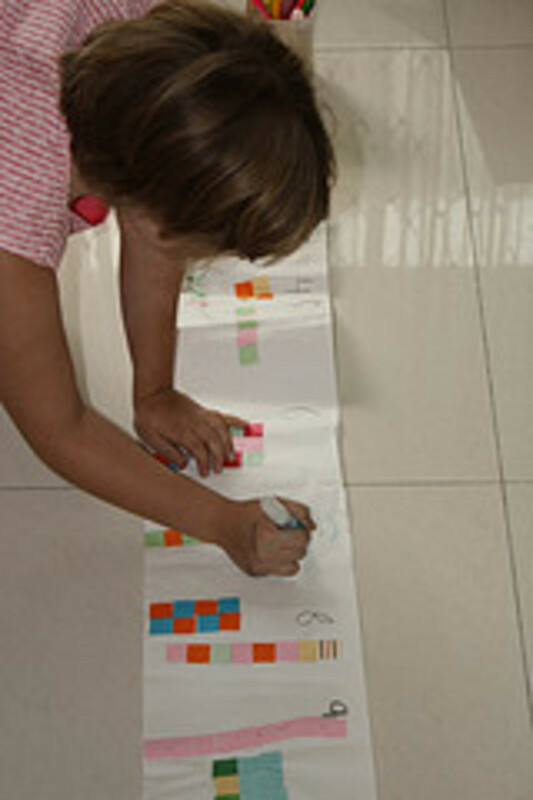 We found that games and activities were a much more efficient and enjoyable use of our time. Note: My oldest is now minoring in Math in College. I purchased some math workbooks for the kids to work on over the summer and they are LOVING them. (For now anyway.) My five year old finished a whole workbook in two days! She already knows many of the multiplication tables and is working on my skip counting lapbook right now. I haven't really taught her much, but she picks it up from the older kids. I think she would really benefit from more hands on activities as she is a very "active" learner-she learns best when she is in motion. Another fabulous homeschooling lens, Jimmie! I love that you point out that “logical thinking, problem solving, and mathematical reasoning are all parts of math education.” So very important! We used some of the books you mention above in our homeschool years ago (my boys are 26 and 23 now) and I remember another book called “Baseball Math” (not the same book I see on amazon.com now, I don’t think, although that one looks good, too). “Games for Math” by Peggy Kaye was one of my all-time favorite books and I see that it is apparently back in print and I’m so glad that this generation of kids can benefit from it, too. I do appreciate your recommendation! It's not for sale (new) at Amazon. But I'll look for it elsewhere. [in reply to KarenHS2] Karen, thanks so much for the positive feedback. It means a lot that my ramblings are of help to others. It seemed to take me so long to mentally wrap my mind around this whole living math thing; it shouldn't have to be so hard. I hope my journey will help others skip over some of my hard parts. I've been re-reading my right brained math articles to refresh my memory. My daughter is not super RB, but she has tendencies. Besides, the RB teaching methods are just good practices. This was very well done! I would also like to add Math Ther Way by Mary Baratta-Lorton from the Center for Innovaton in Education (might also be sold on Amazon?). This thick book is full of games and they state what the goals of the game are at the top of each one. 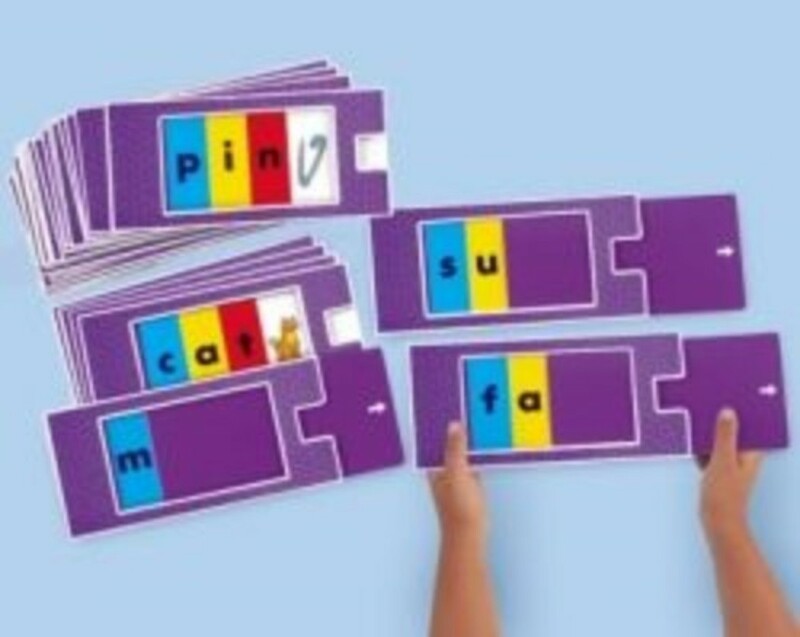 They are divided into sections, like the sections of a regular math textbook and they have ways of transitoning from just hands on games to worksheets. I have been using it with my boys and even my four year old understands the relationship between addition, multiplication and division. Can't go back to regular textbooks now! Jimmie, absolutely fantastic lens! I recently joined the Living Math list and have been floundering a bit. Your story really laid it out for me clearly and now i will have some reference points. We have been incorporating games for some time. The idea of a progression is very appealing. I am making this journey with my youngest child. I am afraid the three older children have had to suffer through more or less traditional math. At least, they didn't have to do it in school where every small hesitation in understanding is public. I am off to lensroll this to my Right Brained Learners lens. And you have inspired me to take a fresh look at that lens and possibly incorporate a bit more of my progression story there. i went to engineering school for my degree and excelled with "standard" math instruction; however, most people do not. i've taught math in both a public high school and an alternative high school and now see that there really needs to be some reform in math education. it is one of the only subjects taught from a purely memorizational (i think i just made that up ;) standpoint. real world application and some interaction could really help learners to master the basic concepts and become more comfortable with the subject in general. great lens. Loved your honesty. It is hard to transition. As you are doing, I use standards (The NCTM Standards are great - more detailed than Focal Points - but Focal Points are great!) as my goals. Everything else, books, workbooks, textbooks are resources to get us where we want to go. Brilliant! Love the story of the journey, and seeing where you ended up! Wonderful lens! 5* and lensrolled to Money As Debt (a real Math Alive subject if I ever saw one). cartoon where trig was demonstrated on a pool table. And the absolute best math class ever was my college tech math class. Trig, algebra, and geometry all rolled into a nice course based on practical applications.